The nonprofit company brought recycling to the county 23 years ago, but increased competition and loss of its biggest member, Farmington, has hurt business. Towns in the Franklin County are exploring what recycling options they have now that the Sandy River Recycling Association plans to sell its assets and end operations June 30. The nonprofit organization that serves Franklin County and some nearby towns was hurt by competition from the no-sort recycling industry and from increased costs associated with recycling, and recently lost its biggest member, Farmington. At the time the recycling group was formed, the statewide recycling rate was 17 percent. It has since doubled. Josephson said over the past 23 years the association recycled 26,000 tons of material that would have otherwise ended up in the trash. 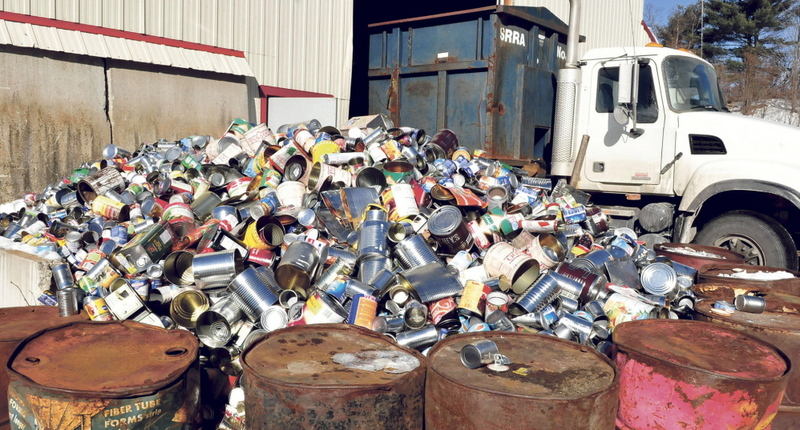 The recycling association at its peak in 2003 had 21 members and recycled 2,000 tons annually. In 2013 it recycled 800 tons and if the association had continued without Farmington, that number would have dropped closer to 600 tons. The association and the Androscoggin Valley Council of Governments are working with member towns to find other options before the group dissolves. Effective immediately, the recycling center no longer accepts No. 1, 3, 4, 5 and 7 plastics, which are expensive to resell. Those plastics include items such as yogurt and butter containers. The center will accept No. 2 plastics, such as milk jugs, until the operation shuts down June 30. The association will also hold on to and resell its composting license, which Farmington considered taking over in a partnership with the University of Maine at Farmington. The recycling association lost its largest member, Farmington, when selectmen unanimously voted last month to discontinue the contract with the group and switch to Archie’s Inc. The Oxford County company offered to take over recycling at no cost to the town, with plans to recoup costs through the sale of recyclables. The association increased its fees overall by 31 percent for the 18 communities it served after running out of reserves to subsidize the costs to the town. “When we ran out of that reserve last year, we started slashing our budget, laying off people and raising our prices. We let them know we had to charge the true cost of our service,” Josephson said. The association also projected its fees would continue to increase in the upcoming budget cycle if it had not dissolved. Member towns at the time it announced its dissolution were Carrabassett Valley, Carthage, Chesterville, Coplin Plantation, Dallas Plantation, Eustis, Farmington, Industry, Mercer, New Vineyard, Rangeley, Rangeley Plantation, Sandy River Plantation, Sidney, Strong, Temple and Weld. Those municipalities that were members as of Jan. 16 — when the vote to dissolve was held — will divide the association’s assets among themselves. Their share will be proportionate to the payments they made for recycling over the past five years, with those who paid more into the association getting a higher proportion of the divide. Sidney select board member Kelly Couture said the town is researching alternative recycling companies before the formal announcement was made about the dissolution. Towns pay the association quarterly, but if they leave mid-quarter then they will only pay for the percent of the quarter they received service. If all towns find alternatives before June 30, then the association might shut down early. Strong Selectman Jim Burill said the town already has private contractors that pick up recycling and bring it to the association transfer station, and the town will have to decide how it wants to replace the association’s services. Josephson said so far Mercer and Carrabassett Valley officials are talking about using Waste Management, Rangeley is interviewing different possible contractors and Chesterville sent the association a note saying it no longer needs their services. She said recycling was brought to the area when it began in 1990 in response to legislation promoting recycling. At the time, a community organization, rather than a for-profit business, was needed to bring it to the county.